Pocket WiFi Seoul uses SK Telecom network. Business users and customers who are concerned about coverage issues, we advise you to rent the Pocket WiFi Korea (LTE) model. Pocket WiFi Seoul model uses Wibro network which is older and less reliable. Officially it covers some cities outside Seoul but we don’t recommend our users to use it outside Seoul because the quality of the network is very poor. Coverage in Myeongdong, Dongdaemun and Gangnam area is very poor with this product so we advise customers who are staying in this area to rent Pocket WiFi Korea(LTE) model. Click the link below to check the coverage. The web page is in Korean but it’s quite comprehensible once you translate it with Google translator. Pocket WiFi Korea uses LG U+ network. LG U+ launched the world’s first nationwide LTE network in 2012. 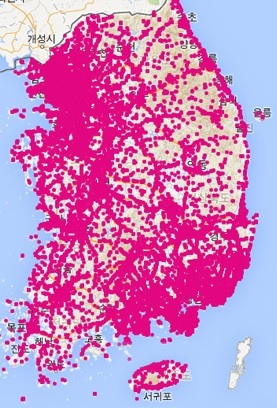 It’s got nationwide coverage everywhere in Korea including Jeju island and Seorak mountain.